The Iridium AC Travel charger provides rapid charge for optimal satellite phone performance. The AC travel charger can be used to power phone when the battery is depleted. 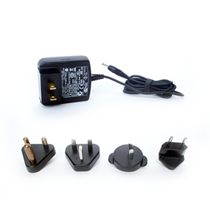 The Iridium AC Charger comes standard with US plug and includes four international plug adapters for use in Europe, Australia, India and the United Kingdom. The Iridium AC Travel Charger enables 2.5 hour charge time for Standard Battery, 3 hr charge for High Capacity Battery & 5 hr charge for Ultra High Capacity Battery.